AppZapper from appzapper.com doesn’t really find everything, Open Office from openoffice.org for Windows/Linux/Solaris/FreeBSD, NeoOffice 2.0 Aqua Beta 3 from planamesa.com for OSX, ReplaceM from boolean.ca for Windows text search and replace, DVD Capture from to take screen snapshots of DVDs as they play, Chi Pet Widget from http://novisdesign.net just for fun, SuperDuper! for Mac backups at shirt-pocket.com, SyncBack for Windows backups from 2brightsparks.com, Dragon Drop for tabbed windows from cs.oberlin.edu/~dadamson/DragonDrop/, All US airport wifi hotspots listed at travelpost.com/airport-wireless-internet.aspx, ProTools petition for blind accessibility at protoolspetition.org, how podcast searching stinks, 285714, Dash Clipping from FondantFancies.com, Crossover from codeweavers.com to run Windows apps on the Mac. Quality Control director Steve is worried that he may lose his job here at the NosillaCast because he hasn’t found any blatant errors in the podcast in several few weeks. I’ll try to throw in a megabyte for a gigabyte or something like that to keep him entertained, or he may start counting the number of times I stumble over a word, and NONE of us want to see that! Last week I mentioned during the install of last.fm that it was dumping files all over my machine that would take me ages to find all the pieces to get rid of them. Listener Mike from Wisconsin and listener Mike with two ee’s both suggested that I try App Zapper from appzapper.com. they say on their website that even though OSX has this nice drag and drop installation, in reality the applications install preferences, caches and other support files throughout your computer that take up space and generate clutter. I had actually heard of App Zapper – a lot of people swear by it, so when it was up for half price on MacZot! I decided to check i tout. Unfortunately I was not impressed by App Zapper’s ability to remove files. I forget which application I had just installed, but I ran App Zapper and it seemed to remove the app. I then did what I usually do when i want to get rid of an application, and that’s to click on the hard disk in the Finder view, and then in the spotlight search window, I type in the smallest segment of the application name that is unique, which searches the entire drive for that name. Well, even though I’d run App Zapper, I found several very obviously named files in obvious locations like preferences. Maybe App Zapper works for some applications, but since it failed its first trial with me, I can’t recommend it. If you’ve used App Zapper and found it to be useful I would like to hear about your experiences. maybe I found the one application that App Zapper couldn’t zapp? Do you wish you could give Microsoft more money? well, if you’re one of the rare few who don’t, perhaps you should consider a free and open source alternative to Microsoft Office. I think I’ve talked about the options before, but the tools keep evolving so quickly it’s worth mention again. 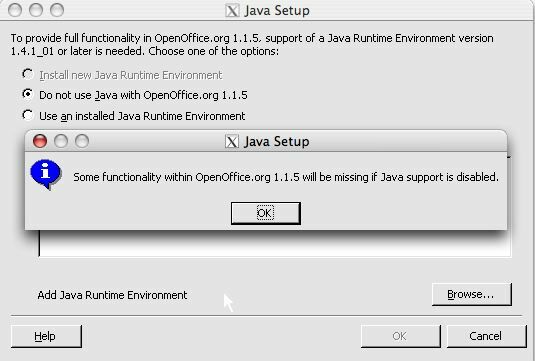 If you’re on Windows, Linux, Solaris, and FreeBSD can all get the free Open Office from openoffice.org. Technically you can also get Open Office for the Mac too, but it runs under what’s called X11. I don’t think I can explain what X11 is precisely but all I know is that it’s REALLY slow to launch. gruesomely slow. for the PowerPC based Macs there was another good alternative, called NeoOffice J, which was a Java-based version of Open Office. i was really bummed though when I got my MacBook Pro and Neo Office J wouldn’t run. Not sure why it and a couple other Java based programs would not run, while other java apps like JAlbum WOULD run. In any case, I was delighted to hear recently that the lovely folks over at planamesa.com have come out with NeoOffice 2.0 Aqua Beta 3, which runs on the Intel-based Macs! I really encourage you to try out either Open Office or NeoOffice. I have actually found situations where Neo Office could open files that Microsoft Office could not! Hey, they’re free, what do you have to lose by giving them a try? You don’t just get a Word, Powerpoint and Excel equivalent (called Writer, Impress and Calc, bu tyou also get drawing and math programs. HDA Bob, avid NosillaCast listener and also coincidentally my Honda mechanic for the last 28 years sent in a great little freeware application for windows because he knows I’m alway slooking for labor saving programs. the problem he had to solve was how to replace the fax number he had in 974 customer files. I’m assuming this is because of the recent area code additions in Los Angeles. He found the application ReplacEm (spelled replacem) from boolean.ca. the folks at Boolean say they’re offering this for free, but ask that you bookmark their website so you’ll think of them when you need quality software development work done. Based on Bob’s review of ReplacEm, it might be a good idea to keep them in mind. So Bob was facing replacement of this number in 974 files, so first he did several of them manually through Microsoft Word, and then started looking for another way. When he found ReplacEm, he entered all the information in the startup screen and sat back, expecting it to be working for hours. It took exactly 4 minutes to change all 974 files to perfection. He said it can replace any text string in any text file and it worked great for him. I have to tell you I tried to work with ReplacEm and the interface was very unintuitive to me. I messed around with it for over an hour and I could never get it to find the text string in my document files and do the replacement. what an odd world that my mechanic is smarter than me – he got it to work but I couldn’t! If you have a bunch of docs in which you need to make a text change, check out ReplacEm, but make sure you’re as smart as my mechanic before you try! Well Mike, thanks for the nice words, and I’m glad you understand the importance of keeping your wife happy! I checked out DVD capture from digitallyobsessed.com/software.php3. this is one of those sweet little freeware programs that solves a niche problem perfectly. No bloatware, just a clean solution. I downloaded this 250KB program (yes, that’s kilobytes not megobytes) and put in a DVD to play with. DVD Capture is actually a helper file for use with Apple’s DVD Player software, and it shares the same brushed aluminum interface. From DVD Capture you have a lot of the normal DVD controls – you can play, stop, pause and mute the DVD. You can also fast forward or step through a scene frame by frame and you can get back to the menu on the DVD. You can choose to have your screen snapshot saved to a file or just to the clipboard. It took me a couple of tries to figure out how to get full screen to go, until I noticed the Capture delay slider at the bottom above the capture button. once you hit capture, you have a couple of seconds to switch to full screen mode in the DVD player application, then you’ll hear the camera clicking sound to tell you the screen snapshot has been made. I haven’t figured out what a couple of the buttons are actually for – there are buttons for up, down, left and right. No clue what those controls do! I pushed them a bunch of times, but nothing seemed to happen, there’s no help file, and there’s no documentation on the website! Oh well, with all the buttons I DO understand, I can get this nice little tool to do exactly what I need it to do! thanks for the great tip Mike. When I first started this podcast, I promised that I would only show you applications which solved real problems. I was weary of people who said, “hey, try this, it’s cool” but would never tell me what problem it solved or why I would care! Well, if you’ve been following along in the home version of our game for the past year or so, you’ll realize that I stray from this serious commitment pretty much every week! Well, this week is no different – I introduce to you, the Chi Pet Dashboard widget for OSX courtesy of listener Leonard. He did note that it’s not as good as the app Sidenote that i reviewed last week, but if you go to http://novisdesign.net you can download and install Chi pet, which is essentially, as you’ve probably figured out, a digital version of the chia pet, that weird clay animal you could buy only at Christmas time and then make a paste of seeds and goop and spread them all over the clay, and then if you put this creepy clay seed goop thing standing in a plate of water, something akin to sprouts would grow all over the “pet”. I have a friend who bought chia pets for all his family members for Christmas one year, but that’s another story. If you always wished YOU had a relative just this considerate, check out the Chi Pet widget. Let’s talk about a subject we should have discussed earlier – backups. I know, it’s like how you should floss every day, and you KNOW you should, but somehow something more important comes up. I have to confess I didn’t actually run regular backups until just a few years ago, and it wasn’t because I didn’t think I was at risk, or even because I never tried. In reality, I bought several different applications to run backups for me and could never figure them out! I know everyone swears by Retrospect Remote, but I’ll be darned if I could have figured that program out, never did get a single backup out of it. Backups are just like exercise – if it’s not easy and accessible and nearly effortless, most of us won’t do it. If you pick a gym that’s 12 miles from home and you decide to work out at 4 am but you’re a night person, it just ain’t gonna happen. Backups are like that – in the best circumstance they run entirely unattended. That takes the human laziness and slothfulness out of the occasion. Another deterrent is cost, even if what you’re protecting are the precious photos of your newborn, if the software or hardware to do backups costs too much, then you probably will procrastinate about it setting it up. You’d feel bad about it, but still you’d drag your feet. On the Mac, there’s a piece of software that solves all of these problems, and it’s called SuperDuper! and it’s available from shirt-pocket.com for the grand sum of $27.95 US. The folks at Shirt Pocket have written a piece of software that not only executes what it promises, the instructions are written in such clear language that even I can follow them. SuperDuper! allows you to back up certain folders, your entire user directory, or even to make an exact, bootable duplicate of your drive. Within those options, you can choose to create a new copy every time you back up, which would take a really long time, or you can choose to have only files that have changed or been created since the last backup be copied over to your backup drive. You can set a schedule of when to run the backup unattended, which is the ideal condition. Since I am 100% mobile, my laptop isn’t on at night, or unattended at any time really, and my backup drive isn’t with me during the day, so I do it by hand, but it’s so easy that I actually do it weekly. I only back up my user directory, because I know I could recreate the operating system installation and reload all of the applications. I know that would take a long day to put everything back in place, but I weigh the risk of that happening against how long it would take to run my backups each week, and I’m willing to take the risk that I have to rebuild my system. In my case it would probably be a good thing to start over because I load so much garbage on my system it’s a good way to clean house once in a while, right? Once you’ve gone through the menus to tell SuperDuper! exactly how you want your backups to run, you never have to do that again. Connect your backup drive, launch SuperDuper! and click Copy. It asks you a couple of times if you’re sure you really want to do what you’re telling it to do, and the default buttons if you just hit carriage returns are all to stop the backup. This is important because you could easily wipe out information if you’re not paying attention. You have the software now, but what kind of hard disk should you get? An external drive is an easy solution, and they’re dirt cheap these days. I prefer firewire because the sustained transfer rates are faster, but USB only devices are easy to find and tend to run slightly cheaper. I just did a quick search for hard drives at CompUSA, I limited my search to 7200 RPM drives (that’s how fast they spin, which affects how long your backup will take to write. 7200 is standard for drives in towers, the slower 5400 RPM drives are used in Notebooks to save battery life, and 10,000 RPM drives are the best but will cost you more. Sticking with the middle ground at 7200, I filtered to external, and then sorted by price. Without even really scoping out the pricing sites, I found a 250GB external firewire/USB drive from ACOMDATA for only $60! So lets do the math here – $28 for the software, and $60 for the hardware, and the effort of pushing the button once a week, you could protect your family photos or that crucial spreadsheet. What do you say, willing to give it a try? One thing we should talk about is where you keep your backups. By backing up to this external drive you’ve protected yourself from the highest probability, and that’s that your internal drive will fail some day or that you’ll accidentally delete something you really need. What you haven’t protected yourself from is fire, flood, all the other natural disasters. It has been suggested that you get two drives and keep one at home, one at work, and swap them back and forth each week. This makes a lot of sense – I don’t do that because wherever I am, my laptop is with me, so half of the time my backup is in the opposite place as my Mac (if I’m at work the backup is at home) and the other half of the time they’re in the same place. I’ve decided this is an acceptable risk, but you need to make that decision yourself. I would like to recommend a good backup software for Windows as well, but I don’t have any direct experience on which to make that recommendation. I did check out the forums on Shirt Pocket’s forums, figuring someone would have asked for an equivalent to SuperDuper, and in there someone recommended the free version of SyncBack from 2brightsparks.com. SyncBack is available in 12 languages, and there’s also a shareware version that gives you enhanced capabilities. the guy who recommended SyncBack said it doesn’t do full system clones, but it’s possible the shareware version does that. If any of you out there have a simple, easy to use, low priced backup solution for Windows, I’d really like to hear about it so I can pass it along to our listeners. Let me know also if you start doing backups because of my passionate pitch here, perhaps to give others inspiration to do it too! Research Department Niraj has evidently been on sabbatical lately, but he came out with a fun freeware app for the Mac this week. It’s called Dragon Drop from cs.oberlin.edu/~dadamson/DragonDrop/. DragonDrop is intended to reintroduce some of the functionality lost with the death of tabbed windows from OS9. In the old days, we could drag an open window to the bottom of the screen, and a title-tab peeked up, readily displaying its contents at a click or a drag, and we could make them disappear again by clicking the tab again. I tested out Dragon Drop, and while it does do what it says it will do, I don’t find it’s functionality I really miss. I do really like the developer’s sense of humor – the software is referred to as being “version one point three-ish”. I love that. The developer refers to this software not as freeware or shareware, but they call it Happy Ware. Here’s what you have to do if you use Dragon Drop: “If you use DragonDrop, you must be nice. To put a concrete mandate behind such a general statement, do something unexpected and good for someone you don’t know.” Isn’t that cool? When I first launched Dragon Drop I couldn’t figure out how to make it GO. I launched the app, but all that did was show me the name of the app up in the menu bar. Once DD is launched and visible in the dock, you can drag any folder icon onto the DD icon in the dock and it creates the tabbed version of it at the bottom of your screen. One thing I’d like to see Dragon Drop do is to allow us to tab entire applications, basically minimizing them as though we had the task bar on Windows, that would be pretty handy. I do miss the task bar when I’m in OSX, for some reason minimizing applications to the dock is not as intuitive for me as just clicking on the little minimize button in Windows. If you travel a lot, and get stuck in random airports across the US, you may find this website from my buddy Ron useful. It’s a guide of all the wifi hotspots in US airports. For each airport, it tells you the service providers, hourly/daily/monthly charges, tells you if it’s free, and gives you the locations of the different hotspots. They first give you the top 20 busiest airports, so you can find your probable airport faster. I’m pretty disappointed that more airports don’t have free wifi – Phoenix, Las Vegas, Orlando, and Philidelphia have free access, and JFK has free access at the Jet Blue terminal. Anyway, if you want to find the free wifi hotspots, check out travelpost.com/airport-wireless-internet.aspx. Ron did a smart thing – he made a pdf file of this directory to save on his laptop so he can find the hotspots since he won’t be online while he’s looking. Thanks for the cool tip Ron! One of the biggest high end audio applications is called ProTools by Digidesign systems. In the 1990’s they worked with a consultant to make their software accessible to the blind. this helped create a tremendously viable opportunity for blind audio engineers. Unfortunately the screen reader software used disappeared with the advent of OSX. Now with Apple’s built in VoiceOver, ProTools could bring back their accessibility. In an effort to encourage them to do so, some folks have put together a petition with a call to action for Digidesign. If you’re interested in helping out here and throwing your support behind the blind audio engineers, I’d appreciate it if you stepped on over to protoolspetition.org and signed up, it just takes a couple of minutes. I’m sure all of the other tech geek podcasts you listen to have been talking about the new iPod Nano’s, and the newly redesigned iTunes music store. I don’t want to talk about what everyone else is talking about, so instead I’m going to complain about the iTunes Music Store! I really do like iTunes, don’t get me wrong, but there’s one thing that really bugs me, and that’s search. go to iTunes, new or old, and go to podcasts and do a search on Nosilla. do you find anything? no, I’m betting not. what kind of cruddy search is that? You have to actually type out NosillaCast to get my show! c’mon, Google can find it in the gajillion websites it searches (3 pages in it finds Eric’s letter to Nosilla), why can’t iTunes search tens of thousands of podcasts? Let’s try searching by Allison. Well, technically it does find that, and puts it in the list below, but what you really notice are the graphics on top for some other shows, music and movies. What irks me is that many of these don’t have Allison anywhere in their description. I know everyone loves NPR, but why do they get a hit for “this I believe” for a search on Allison? Maybe someone named Allison put the link up? I went over to Podcast Alley and did a search on Nosilla, and up popped the NosillaCast. I tried it on Podcast Pickle, and it couldn’t pull off this complex search. I tried the search on Odeo, and oddly it found three mentions of the NosillaCast on someone else’s podcast, but not mine! I narrowed the search to NosillaCast and it found it right away. Hmmm…next I tried the search in Yahoo! Podcasts and again it couldn’t find it until I typed in the full name. Same thing with Podzinger. this is just weird. I may have made this sound excessively narcissistic, but my origina point was that the search on iTunes is really lame, but now I guess I’ve proven that most of the podcast directories have lame search too. Ok, this next one is PURE geek value. I heard about a really interesting number – it’s 142,857. I’m going to just read the digits because you’ll be able to hear the pattern differently: 142857. At first blush this doesn’t sound like a fascinating number, but follow along and you’ll see why I like it so much. Start with 142857. Double it, and the digits cycle around but stay in the same order – you get 285714. Multiply by 3, and they move again, to 428571. It’s kind of hard to picture in your head, so let me explain it by using another number that doesn’t actually work this way. say the number is 123456. if I multiplied it by two, it would change to 234561, and then again when trippled would be 3456123. See what I mean by cycling? anyway, back to our number 428571. If you keep multiplying, it keeps cycling all through x6, but when you hit x7 it turns into 999,999! Weird! then go to x8, and now it’s a 7 digit number instead of 6, but the same numbers are back in sequence, except the first and last digit add to make one of the numbers! This is crazy! this sequence continues till you get to 14x when it turns into 1999998. see how the first and last digits add to 9? I played with this number for quite a while and showed to my buddy Ron and he said the number is based 1/7th. I figured this fun number might be in wikipedia, and of course i found it there at en.wikipedia.org/wiki/142857_(number). According to wikipedia, it’s 3 cubed x 11x13x37. this is probably more than you wanted to know about this fun number, but I think it’s just beautiful. not everyone would describe math as something beautiful, but sometimes you just have to admit that it is! 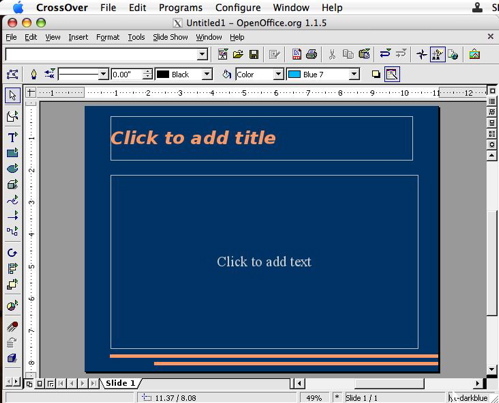 One of the few features Steve Jobs showed of about Leopard at the World Wide Developer’s conference was the ability to make a widget that showed a piece of a web page that would actually get updated. The folks at Dash Clipping from FondantFancies.com beat Apple to it. Thanks to research department Niraj, I was able to download and install this little widget. Imagine you’ve got a news site that you’d like to take a look at very quickly, say one bar down the left side usually has some interesting stories with links, if you did a Dash clipping of it, you’d be able to have it updated once an hour, every two hours, six hours, 12 hours or every day. You can also cause it to refresh by hitting command-R which also does a really cool graphic to show it refreshing. In fact, that refresh button entertained me for several minutes as I sat and giggled at it saying “wheeee”. This next subject requires some careful explanation. Imagine you have a PC with some lovely applications that only run under Windows. But you’ve seen the light and know you desperately need and want a Macintosh. As we’ve explained here, you can run Parallels to run Windows, or to save a few bucks but live with some inconvenience you could run Apple’s Boot Camp. This solution works well, but you still have to pay the man – you have to pay Microsoft $2-300 for XP! tough break if you’re the one writing the check. There’s actually another way, and I’m not sure I believe in it yet, but it does seem to work. there is a project in the open source community called Wine, which is a recursive acronym “Wine Is Not an Emulator”. Clever acronym and all that, but what does it mean to us? It turns out Wine allows you to run Windows applications under UNIX! I always figured this was fake, but I had not opportunity to test it, until the lovely folks over at codeweavers.com created this environment for the Mac, and called the beta application CrossOver. the beta is good for 60 days, which really allows you to wring out the bugs. CrossOver downloads and installs like any other application, but that’s where the resemblance to “normal” ends. Crossover is an application, but you install applications inside it. To make it cute, and to keep with the Wine theme, you install these applications into Bottles. 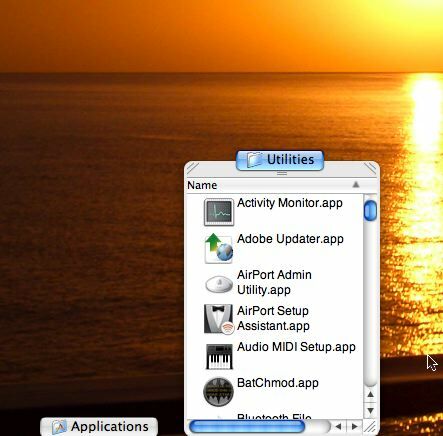 When you first launch CrossOver, you are given the option to install applications, and you’re shown a list of about 25 applications that have been tested to run under CrossOver. The List includes Flash, FrameMaker, Photoshop, Dreamweaver, Half-Live, Lotus notes, and about 15 versions of Microsoft applications, plus Quicken and Steam (whatever that is). In order to install any of these applications, you have to already have access to the Windows installer file – the install.exe for Lotus Notes for example. Once you tell Crossover to install, and point it to the installer file, it acts just like any other Windows installation. an amusing bit is that it simulates a Windows reboot but it’s way faster. I installed both IE 6 and Lotus Notes 6.5 and both actually seem to work. IE gave me a really creepy feeling – seeing that old interface floating unfettered amongst my OSX applications. somehow it was less disturbing to watch windows apps in Parallels because they were captive in the Windows window! 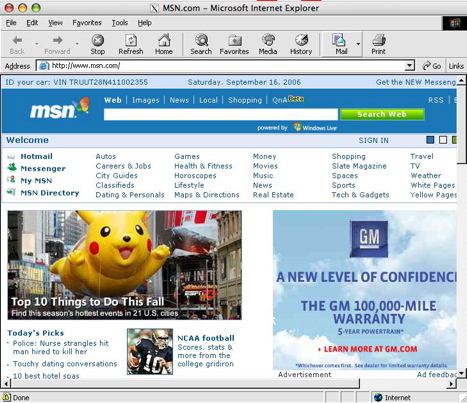 IE is a little hinky under Crossover, kind of blinks a lot as it updates. I did get it to crash by trying to play a video on the MSN site, and it’s not the snappiest thing around. IE under Parallels is definitely more stable and functional than under CrossOver. Lotus Notes ran ok for a bit, but after a few runs it wouldn’t come up at all. I got bored with it at that point, but a few days later I realized I could probably just trash the plist file for CrossOver, and after I did that Notes came up again just fine. I should take a step back a minute and explain what I did. In OSX, applications create these little plist files in the preferences folders. I’m not exactly certain what they are actually for, but they seem to get corrupted on occasion (not rare occasion) and when that happens all you do is throw them away and when you relaunch the application it recreates the plist file. the easiest way to find the plist you’re looking for is to click on the preferences folder inside your user library, and then in the spotlight window type in a small portion of the name of the misbehaving application. Many times the plist file will start with com.apple. and then the name of the application. Anyway, once I’d trashed com.apple.CrossOver all was well again. Now it was time to try an unsupported application. I thought it might be fun to try installing Open Office for Windows, since it’s not available for the Mac as I mentioned earlier. I thought it would be fun to compare Neo Office to Open Office side by side. I downloaded the install.exe for Open Office and then chose Install Unsupported Software from the software installer. this is where I got to choose New Bottle into which to install. 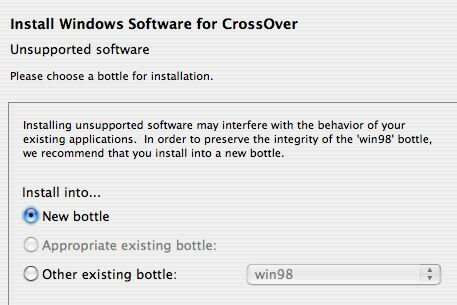 They recommend you don’t put unsupported software in the win98 bottle, which is where all the supported software goes. No idea what this means, but I like it. 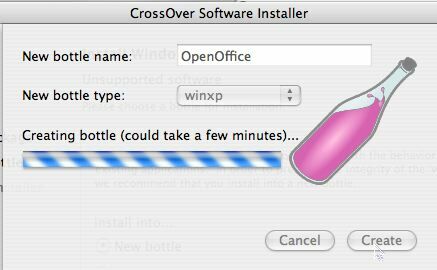 I named the new bottle OpenOffice, and made the new bottle type winxp. Again since I haven’t a clue what these bottles are all about, I don’t know if it’s good to be in a win98 bottle or a winxp bottle! I then was able to choose the installer file for OpenOffice. I did get a warning that some functionality would be missing because Java support is disabled, but I figured I’d have to live with that because it would just be too weird to figure out how to install Java in CrossOver and have it recognized by another app, so I forged forward without Java. 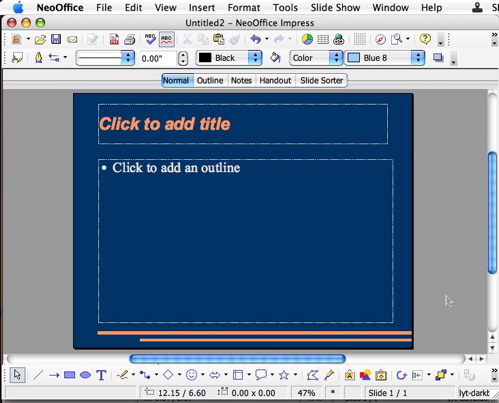 In just a few short minutes I was up and running with Open Office! You’re probably hoping I’ve gone through menu by menu, compared them both to PowerPoint, made a cross reference sheet to compare features, and have an assessment of which one you should use. No such luck. I think the Neo Office version is prettier. Looks like this is a good spot to draw the show to a close, keep all these good comments, feedback, and tips coming – send me emails at allison@podfeet.com, or if you want to send in an audio recording send it on over to nosillacast@gmail.com. Thanks for listening, and stay subscribed.